Optical Power meter for downstream and return-path test in RFoG and PON systems. 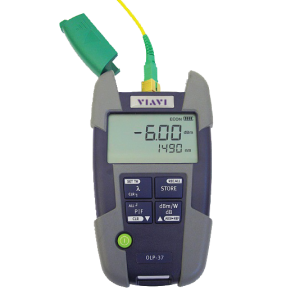 The specialized VIAVI SmartPocket™ OLP-37 optical power meter can be used to conduct measurements during passive optical network (PON) and radio frequency over glass network (RFoG) activation, maintenance, and troubleshooting. It can measure wavelength-selective optical power when testing B-PON, E-PON, or G-PON networks, as defined in ITU-T G.983/4, or IEEE 802.3ah, and RFoG systems, as defined in SCTE 174 2010.